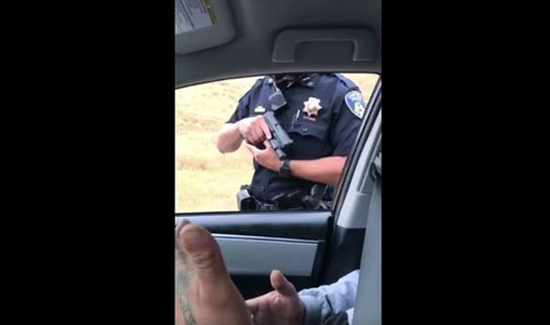 CAMPBELL, Calif. – A video showig the interaction between a Campbell police officer and two citizens during a traffic stop on Highway 101 is circulating on Facebook. The video, filmed by the driver, is a little over nine minutes long and shows an officer pointing his gun at the passenger. The passenger repeatedly asks the officer to stop pointing his gun, saying his hands are clearly visibly and he is complying with the officers orders. The officer continues to point his gun into the car as he calls for backup. According to Campbell Police, the vehicle was pulled over for speeding. The officer asked the driver for her license and additional paperwork. Police say the driver and passenger spent several minutes looking for the paperwork, when the passenger began reaching under his seat. That’s when the officer perceived a threat and withdrew his gun. “We understand that it is never a comfortable position to have a gun pointed at you, regardless of whether it is a police officer. Unfortunately, the length of time that the officer’s gun was drawn lasted much longer than normal based on his location. If this same situation would have occurred closer to back-up officers, it would most likely have been resolved much sooner,” Campbell Police Public Information officer Gary Berg said in a statement. Both the driver and the passenger were issued citations and were allowed to leave. The video has been viewed over 650,000 times generating mixed reaction. Unfortunately, this video is a perfect example of why we need to evaluate how we are arm regular patrol officers. This officer committed assault plain and simple by drawing a weapon and keeping it on the passenger despite the fact that no real threat existed. The only threat that existed was the one created in his own imagination. This officer went from 0 to 100, recklessly. Imagine what could have happened if the passenger had moved his hands even slightly, the passenger could have been needlessly killed. Too many times, the first response to draw a firearm and that needs to change. If the training he was given said this was the proper response, then the training needs to change because it clearly places the citizen at risk. We need to ensure that officers have alternative to deadly firearms and perhaps the first step would be to eliminate the practice of the single patrol officer. Clearly, this officer should not be on the street. You need to watch the latest body cam out of Las Vegas where the driver said the same crap. Officers didn’t have him at gunpoint. After five minutes, the driver grabbed a concealed pistol and shot both the officers. You are clearly anti law enforcement and have never felt threatened in your sheltered life. Any one with any common knowledge knows that on all encounters with police on traffic stops is that officers want to see YOUR hands! It’s part of every officer’s training period. The officer did not have his finger on the gun’s trigger as part of his training. If the driver & passenger had just obeyed the officer’s commands instead of acting like idiots the officer would not have pulled his service weapon. When a police officer tells you to do something …DO IT!!! There’s always time to ask questions afterwards once the officer has the situation under control instead of video taping on your cellphone during a traffic stop. When you keep reaching under the seat…….how is the Officer supposed to know what you’re reaching for? He did what he had to do to return home to his family….alive. Comply with requests, there won’t be any problems.